Crowns, bridges, and veneers are just three procedures we offer at Pure Dental Toowoomba which help to give you your perfect smile. Whether you have chipped, missing, misshapen, or discoloured teeth, Dr Nicola and her team can fix all of these issues and more through the following services. Crowns are essentially an artificial cover which protect the structure of a tooth that has undergone root canal therapy or contains a large filling. 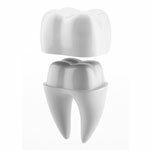 Crowns are also used to fix cosmetic issues, as they can alter the appearance of a tooth and correct a client’s bite. Although a bridge goes hand-in-hand with a crown, the two are certainly not to be confused. 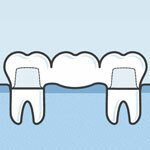 While a crown caps or covers a tooth, a bridge is designed to replace a tooth that is missing altogether. This treatment is only possible if there are two existing teeth on either side of the missing tooth, as these are then crowned with the replacement tooth acting as a bridge in the middle. The bridge is then cemented securely in place. Veneers, on the other hand, are adhered to the front of a tooth and Dr Nicola does this using composites or porcelain, depending on the best treatment plan for your teeth. This allows the treatment to be as minimally-invasive as possible, helping to keep the structural integrity of the tooth. 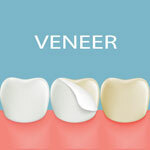 Veneers are a popular choice for cosmetically enhancing teeth, for example, to change their shape or make them appear whiter. Find out if you’re a candidate for one of these options by contacting our practice for an appointment.